WIHA 2.0mm (5/64") Allen Driver. Suits Parma self tapping motor screw. 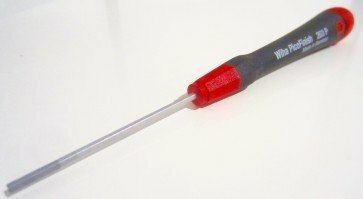 PicoFinish Precision SAE (Inch) Hex Screwdriver 2.0mm (5/64") x 50mm. Molded on tapered handle allows rapid rotation. High performance blade - CVM steel, hard chrome finished Tip - precision ground for exact fit, hard chromed non-slip surface.